The other day we were eating our tea (southern or posher people this means 'dinner'). The boy was kicking off and we had no clue why. He was pointing and screaming. And it transpires he wanted a knife and fork! Now I don't read any developmental books as I am a paranoid person who will feel my children aren't developing properly, then go to the doctors and look insane. But all I will say is my girl certainly wasn't using cutlery at this point (14mths). So my beaut boy is growing up, copying his big sister and wants to be part of the cutlery crew. A true milestone I feel. 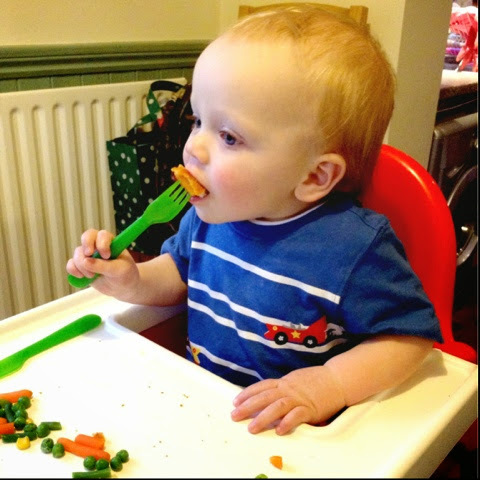 So behold a piccy of when my boy first used a fork! And of course the choice of fork style food was a kids fav: the fish finger. What else?! I cant help but notice we have the same high chair. Can I confess that I am spoon feeding my pre-schooler =( He started to get fuzzy with food and I have to do what I have to do so that he can have food. Spoon feeding worked but now he is big and he wont eat by himself. But I am doing something as a do over. For him to start eating by himself again. I don't know your post just made me think of this. Which just goes to prove all children will do things when THEY want to - no matter what the book says! My eldest boy was much older than all his friends in being able to clap but he got there in the end! Well done your boy! Yay! That's fantastic! Younger children often develop quicker in terms of physical things just to keep up with their siblings. My niece is this age and loves to feed herself.